It’s absolutely free to all who come to Jesus in faith. Yet the grace of God is the costliest gift we’ll ever receive. ”Don’t you see that you can’t live however you please, squandering what God paid such a high price for? . . . So let people see God in and through your body” (1 Corinthians 6:20 The Message). There’s an amazing paradox to God’s grace. It’s absolutely free to all who come to Jesus in faith. Yet the grace of God is the costliest gift we’ll ever receive. It cost God’s Son his life. So in light of what Jesus has done for us, how should we respond? We must be grateful. One way we can show our gratitude to God is by making our lives count. You can’t really understand the grace of God and the price he paid to make it available to you while living how you want to live, ignoring the commands of Jesus, or wasting your life on things that don’t matter. The Bible says it this way: “Don’t you see that you can’t live however you please, squandering what God paid such a high price for? . . . 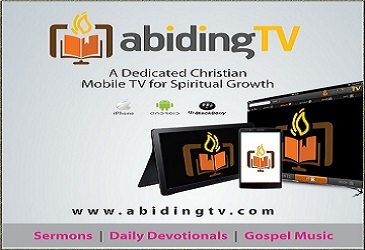 So let people see God in and through your body” (1 Corinthians 6:20 The Message). We all should have the same sense of purpose. Because of what Jesus did for us on the cross, we were spared for a reason: to make a difference with our lives. Jesus didn’t die on the cross so we could go on living any way we like. 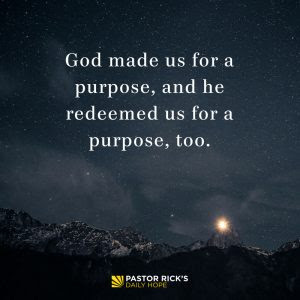 He made us for a purpose—and he redeemed us for a purpose, too. He wants us to fulfill that purpose. The Bible says in 1 Peter 4:10, “Each of you should use whatever gift you have received to serve others, as faithful stewards of God’s grace in its various forms” (NIV). You were given spiritual gifts, abilities, education, and relationships for a reason—to help other people and tell them about Jesus. God saved you so he can use you. The Bible says we can only get to heaven by trusting in God through his Son, Jesus Christ. And we don’t have to earn God’s love or work our way into heaven. The Bible says, “It is by grace you have been saved, through faith — and this not from yourselves, it is the gift of God — not by works, so that no one can boast” (Ephesians 2:8-9 NIV). If you just prayed to accept Jesus, please email me at Rick@PastorRick.com and let me know about it. I’d like to send you some free materials to help you start your journey with Jesus. How have you seen people squander their spiritual gifts? Are you concerned you may be squandering your spiritual gifts? Talk to God about what he wants you to do. He’s gifted you for a reason. What spiritual gifts and talents has God given you that you can use to help others?